TOWNSVILLE, Queensland, Australia, December 4, 2016 (ENS) – To accelerate Australia’s rollout of big solar, the first funding agreement from the Australian Renewable Energy Agency, ARENA, was signed Friday. The new agreement commits up to A$8.9 million of ARENA funding towards publicly-traded Genex Power’s $126 million Kidston Solar Project in North Queensland. The Kidston project is a key component in ARENA’s push to triple Australia’s large-scale solar capacity by supporting 12 new solar farms. But at the same time, Australia is expanding its coal production and transport capacity. The multinational mining company Adani Group’s A$21.7 billion Carmichael coal and rail project has just secured its final major Queensland state and federal government approval. Planned for the transport of coal mined 400 km away in Queensland’s Galilee Basin, the project already has all primary approvals. With Adani Group Chairman Gautam Adani in North Queensland tomorrow to meet with government officials, the coordinator-general has approved an application for the project’s rail line into the coal export Port of Abbot Point. The port’s terminal is being expanded; once complete it will be the world’s largest coal port. The most northerly deepwater coal port of Australia, Abbot Point is situated too near the Great Barrier Reef for environmentalists. Coral across Australia’s Great Barrier Reef has suffered its most destructive die-off on record, according to a new report from teh ARC Center of Excellence for Coral Reef Studies in Townsville. In nine months, bleaching caused by warmer water has killed 67 percent of the coral in a previously pristine part of the world’s largest reef. 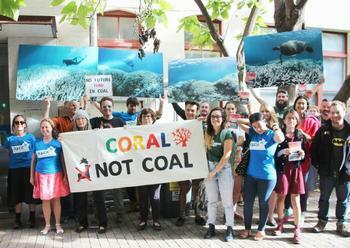 Environmentalists fear that the greenhouse gases produced by extracting, transporting and burning coal is warming all the world’s oceans, including the waters of the Great Barrier Reef. The Australian Conservation Foundation, ACF, is warning that Prime Minister Malcolm Turnbull is preparing to give the Adani Group A$1 billion of public money to fund the coal-transport railway line from the Galilee Basin to the Great Barrier Reef coast. Media reports say the Northern Australia Infrastructure Facility funds are earmarked for the project. During the election, Prime Minister Turnbull said, on camera, that there would be no public funding for the Adani mine. “We are holding him to that promise. We don’t want this mega-polluting coal mine,” the ACF said in a statement today. The controversial project involves dredging 1.1 million cubic metres of spoil near the Great Barrier Reef Marine Park, which will then be disposed of on land. Approval was granted in December 2015 with “strict conditions,” the federal government said. 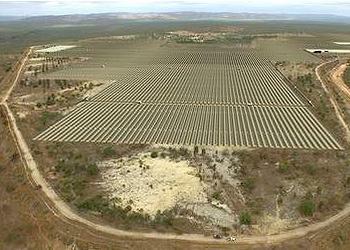 Meanwhile, the Kidston Solar Project will be built on the site of the historical Kidston Gold Mine near the township of Georgetown, about 270 kilometers northwest of Townsville, in one of Australia’s highest solar radiation areas. Phase one of the Kidston Solar Project will have a production capacity of up to 50 megawatts, while phase two of the project will more than quadruple this total capacity up to 270MW. The second project is the Kidston Pumped Storage Hydro Project, with a 250MW capacity. Phase one of the Kidston Solar Project is predicted to increase the total renewable energy generation in Queensland by 5.5 percent. This is equivalent to powering at least 26,484 Australian homes, offsetting 120,000 tons of the greenhouse gas carbon dioxide per year, or removing roughly 33,000 cars from Australian roads. “ARENA’s unprecedented investment in large-scale solar is expected to unlock almost $1 billion in commercial investment that will mostly be spent in regional Australian economies,” said ARENA CEO Ivor Frischknecht. “Nationally, the six plants in Queensland, five in New South Wales and one in Western Australia will be a huge boost to regional areas with the expected creation of around 2,300 direct jobs and thousands more indirect jobs,” he said. The other 11 large scale solar projects are working towards signing ARENA agreements, locking in finance and lining up construction contracts in order to reach financial close early next year.